Definition at line 47 of file ScalarEvolutionExpressions.h. Definition at line 62 of file ScalarEvolutionExpressions.h. Definition at line 57 of file ScalarEvolutionExpressions.h. Referenced by llvm::InterleavedAccessInfo::analyzeInterleaving(), areStridedAccessesIndependent(), canFoldIVIncExpr(), CompareSCEVComplexity(), llvm::AlignmentFromAssumptionsPass::extractAlignmentInfo(), extractConstantWithoutWrapping(), FactorOutConstant(), gcd(), getConstantPart(), getExactSDiv(), getMemSetPatternValue(), llvm::getPtrStride(), getStoreStride(), hasHugeExpression(), llvm::isConsecutiveAccess(), llvm::TargetTransformInfoImplBase::isConstantStridedAccessLessThan(), llvm::ScalarEvolution::isLoopEntryGuardedByCond(), llvm::SCEV::isNonConstantNegative(), isRemainderZero(), llvm::FullDependence::isSplitable(), minAPInt(), SolveQuadraticAddRecRange(), and llvm::ScalarEvolution::verify(). Definition at line 59 of file ScalarEvolutionExpressions.h. 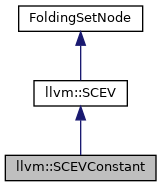 Definition at line 56 of file ScalarEvolutionExpressions.h. Referenced by canFoldIVIncExpr(), llvm::SCEVExpander::expandUnionPredicate(), getAPInt(), getConstantTripCount(), getMinFromExprs(), GetPointerOperand(), llvm::ScalarEvolution::getSmallConstantTripMultiple(), hasUsesOutsideLoop(), llvm::InductionDescriptor::isInductionPHI(), mayUsePostIncMode(), populateDependencyMatrix(), and llvm::SCEVExpander::setChainedPhi(). Definition at line 48 of file ScalarEvolutionExpressions.h.